Prevent owls and hawks from preying on your martins with this Nature House Owl Guard for the Nature House Purple Martin Pioneer house and the Nature House Martin Safety System house. 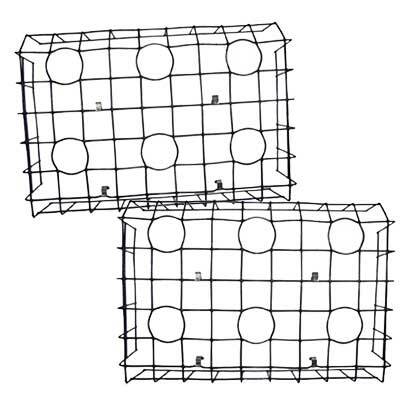 This durable, galvanized metal guard surrounds your existing Nature House Purple Martin Pioneer House or your Nature House Martin Safety System house (not included), and its unique, grid design stops flying predators from reaching the nests. The openings which align with each nest entry are slightly enlarged to 2.5" in diameter, allowing martins a safe and easy passage, and the vinyl coating on the wire mesh reduces feather wear. Stainless steel spring clips allow the two panels to install around your home easily, as well as remove for thorough nest checks. Help the martins in your existing Pioneer House or Safety System House remain safe from predators with this Owl Guard. Some assembly required. Made in the USA.